In Fire Emblem Fates, like in the other games in the series, the characters you control are able to fall in love and even have children. But while many players create intricate breeding plans of who will marry who, I tried something different: I let them fall in love naturally. 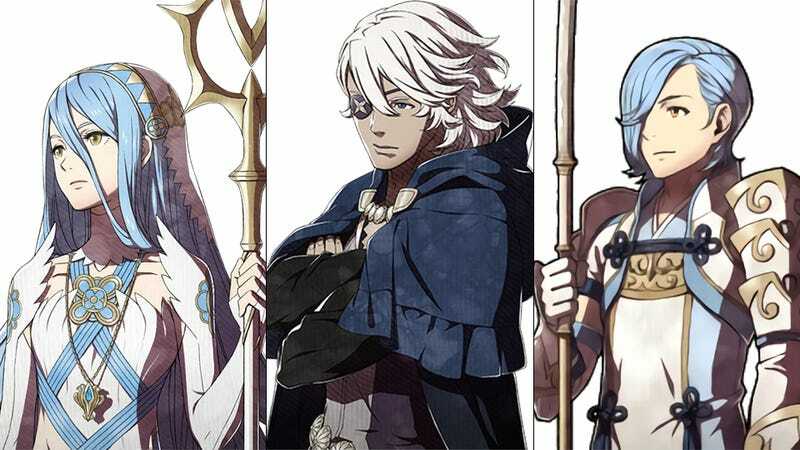 There are actually three different versions of Fire Emblem Fates. All star a princess (or prince if you so choose) of Hoshido who was kidnapped as a child and raised as a member of the Nohr royal family. In the version I played, Conquest, my princess character chooses to stay with the family who raised her rather than her birth family—even as both sides head to war against each other. As you play, you find that your adopted father (clearly evil), sends you on various missions, likely to get you killed off. But your brothers and sisters come one by one to help—each bringing along their own groups of friends. Together, they make up your army. When any two of your army members fight alongside each other—be that attacking together or by becoming a single unit where one defends the other—they start to like each other. As characters spend more and more time working together, they get various scenes out of battle that show their growing relationships. Characters unrelated by blood (as the core of your army is made up of a family of brothers and sisters) can fall in love and have children. These children are then added to your army and can even have relationships of their own—namely with their parents and the children of other members of your army. Of course, this isn’t just related to plot. As characters’ relationships improve, so do their teamwork skills in battle—making certain pairs all but unstoppable. When characters reach their maximum affection for each other, they are even able to re-class into each other’s base class—allowing you to completely change their roles in battle. Moreover, as child characters join the party at level 20—and are thus ready from the start to join an advanced class—children can dramatically increase the strength of your army. Because of all this, it’s no surprise that many players spend a lot of time planning out whom to pair up with whom. Some people just want to see certain characters become friends or fall in love. Others are focused on making the strongest army possible. I decided to try something different: I didn’t plan at all. In battle, I simply tried to make the best tactical choices I could. If characters found themselves often paired together—and thus became friends or fell in love, then so be it. The good news is that playing this way has ended up giving me several married couples and children—though some couples aren’t exactly who you’d imagine ending up together. My first couple makes a lot of sense, both in the story and in the gameplay. My princess character fell in love with her butler, Jakob. In the story, it makes sense that he would never leave her side and the two would eventually come together. In gameplay, this came about simply because they were the first two party members; so having them work together was a necessity. Even as more party members joined, he remained indispensable as both a ranged attacker and healer. Plus, as the two move at similar speeds (as opposed to those mounted on horses or flying beasts), it only makes sense that they’d often be used together in battle. Interestingly, the couple had two children (most couples only have one, which child is dependent on the father). They were Kanna, the child who shares the same unique class tree as her princess mother, and Dia, a slacker healer who is the exact opposite of his serious, responsible father. My game’s second couple was a bit more surprising. Azura, a princess kidnapped by Hoshido from Nohr and raised as part of the Hoshido royal family (making her situation the opposite of your princess’), ended up marrying Zero, the game’s first thief. This couple came about thanks to each character’s special roles in the party. For a long while, Zero is your only bowman—and thus your main defense against flying enemies. Azura is the game’s only playable songstress and has the ability to give any other character a second turn each round. So when facing multiple flying enemies, giving Zero an extra turn was always the best choice. Like my princess, Azura always has two children: in this case Shigure, a serious Pegasus-mounted warrior who is very much his mother’s child; and Eponine, a wild outlaw (and powerful archer) like her father. My last two couples, Camilla/Benoit and Leo/Effie, came together for the same reasons. Camilla and Leo are both Nohr royalty and powerfully mounted spellcasters. Thus, I gave each one a knight for protection. In turn, the lowly knight protectors fell in love with the prince and princess of Nohr, respectively. Camilla and Benoit’s child is Ignus, a knight like his father. Leo and Effie’s child is Foleo, a feminine looking boy and powerful spellcaster in his own right. So, as I near the end of Conquest, I am actually pretty happy with how my characters turned out. It was really interesting to see the various characters naturally fall in love and have children. It made them seem more real and organic. Moreover, the children themselves have made my army quite strong—even if that is a coincidence more than anything else. But will I try the same tactic next time I play a Fire Emblem game? We’ll find out the next time a Fire Emblem game hits shelves.